Last Wednesday, the Catalan Finance Ministry published the liquidation of Spain’s fiscal redistribution scheme of 2011. That year, Catalonia was the 3rd Autonomous Community paying the most taxes per citizen in Spain, with a 119.1% rate if the average were 100%. 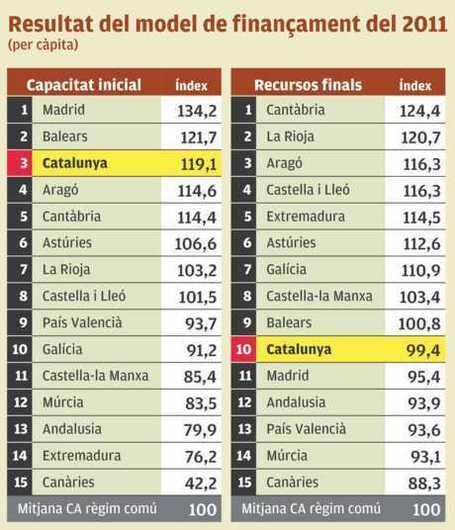 However, after the Spanish Government’s redistribution of money through services and investments, Catalonia was the 10th territory in spending per capita, with a 99.4% rate, below the average. In 2011, Catalonia received €16.91 billion, 3% less than in 2010. The region of Madrid was the Autonomous Community paying the most, since Spanish Government bodies and many multinational companies are based there. It was followed by the Balearic Islands, which received 12.3 million tourists while its population is just 1.1 million. Madrid paid 134% and the Balearic Islands paid 121%. In 2011, the trend from 2010 continued, as Catalonia dropped from the 3rd to the 10th position. Furthermore, Catalonia also ended up receiving an amount per capita below the Spanish average, which means public services in Catalonia receive less money than the Spanish average, despite being one of the richest territories. This particularly hits the most economically-disadvantaged Catalans, who cannot afford private services and have worse public services than in other parts of Spain. In fact, data from 2011 showed that poorer regions, paying taxes per capita way below the Spanish average, end up receiving more money per capita than Catalonia and being above the 100% average, which means they can afford better public services. For instance, citizens of Extremadura paid 76.2% in taxes per capita of the Spanish average, being the second-to-last Autonomous Community in the ranking (16th). However, after the Spanish Government’s redistribution, they were the 5th region, with a spending per capita of 114.5% of the 100% Spanish average. For this reason, Catalan parties want to keep inter-territorial solidarity, but they ask for some limitations, as German states have.